As Americans, and as incredibly busy women business owners, we are more disconnected than ever. In between the thousands of emails, texts and calls we receive, social media posts we have to share and respond to, and the time we spend in planes, trains and automobiles traveling to and from work and meetings, the time we take to create and nourish deep connections with others and the time we set aside for solitude and reflection has grown increasingly less. 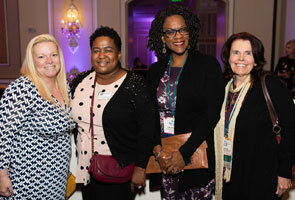 That’s why an event like the National Women’s Business Conference (WBC) hosted by NAWBO, which was held last month in Spokane, Washington, is such an incredible gift. The theme of “Work Well, Live Well” was all about work-life integration and the importance of not only fueling our business success so we can go to the next level, but also dedicating time to connect with family, friends and peers, and nourishing and challenging our bodies and minds. It was also about setting boundaries, relaxing and believing that everything will be okay (remember what our amazing keynote speaker Elizabeth Gilbert shared about that? ).